In our current day and age, consumerism is the rule for many. Following the desolation of the Second World War, the planet braced itself for more trouble in the form of nuclear destruction. Despite the bleak situation, a new type of class was emerging in America: The Middle. This so-called nuclear family consisted of Mom, Dad, Junior, and the ever adorable Tammy. Dad came back from war, married Mom, and together, they played their part in the Baby Boom. Unemployment seemed a thing of the past as more jobs were available, and Dad could provide for the family, whilst Mom had the kitchen to worry about (no sexism intended). Published in a single volume in 1953, The Space Merchants is an industrial thriller that examines excess and materialism. 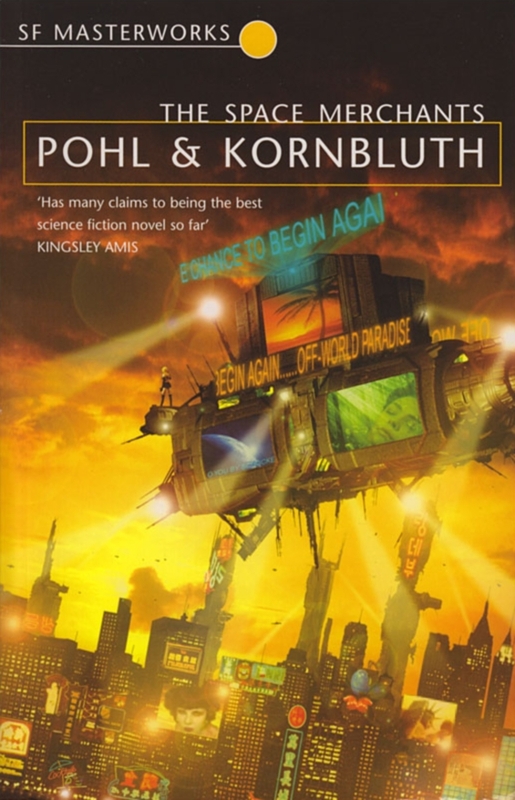 Frederik Pohl and Cyril M. Kornbluth invite us to a world that is quite familiar and worryingly relevant to our current circumstances. In the late 20th Century, corporations have replaced governments as the ruling power. The world is overpopulated, products contain addictive substances to control the masses, and vital resources such as fuel and water are rare. Even something as simple as a rickshaw ride is considered a luxury. The planet Venus had been measured and judged suitable for human settlement. Mitch Courtenay, our protagonist, works as a star-class copywriter in the Fowler Schocken advertising agency, and is assigned the ad campaign which would attract colonists to Venus. However, a conspiracy unfolds as Mitch is betrayed by people within Fowler Schocken and ends up working as an ordinary stiff for the company. With no ID card to reclaim his old identity, Mitch uses his skills to create propaganda for a group of communist revolutionaries, and in a twist of fate, becomes a hero to the common people he used to take advantage of. In a race against time, Mitch must uncover the conspiracy and discover why he was betrayed. The Space Merchants is famous among science-fiction novels for giving an accurate representation of what the future had in store for consumerism. The abovementioned Baby Boom was a time period (from 1946 to 1964) that saw a significant increase of the birth rate in the US. Pohl and Kornbluth predated the fears of environmentalist groups concerning the effects that population growth will have on natural resources – specifically, petroleum and water. The novel’s satirical tone assaults the corporate world of advertising, from its sociopathic CEOs to its bandwagon protagonist, who goes about his day-to-day drudgery, before realizing that the entire system he’s come to love is really a totalitarian state. This kind of awakening could be seen today in the selfless intentions of conspiracy theorists and whistle-blowers, using the Internet as their weapon of choice in alarming the masses. Pros: The Space Merchants is a highly dazzling piece of science-fiction. Its originality and pacing will keep the reader focused for a good week or two. Readers will also take delight in knowing that Pohl worked in an advertising agency in order to keep the novel fresh and exact to the truth. Cons: On the other hand, the characters aren’t very memorable and the ending leaves a lot to be desired. That is to say, the build-up results in a predictable and formulaic conclusion.